Iceberg Alternator upgrade W/Self Exciting (one-wire) voltage Regulator, fits Delco-Remy CS-130 type alternator. NOTE: Check the images above to see what your bearing size is. Large bearing has 5 ribs around the bearing boss, the small bearing has 3 ribs. Check your alternator before ordering. 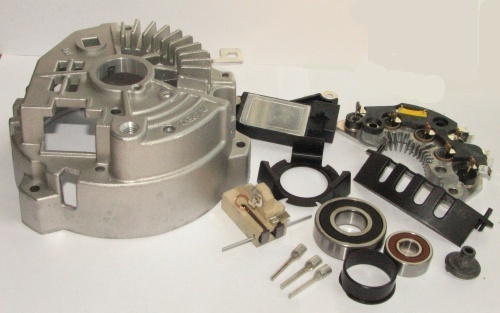 General Motors type "Iceberg" finned, self exciting (one-wire) alternator upgrade kit, fits Delco Remy type CS130 & CS121 series alternators from 1987-1995.